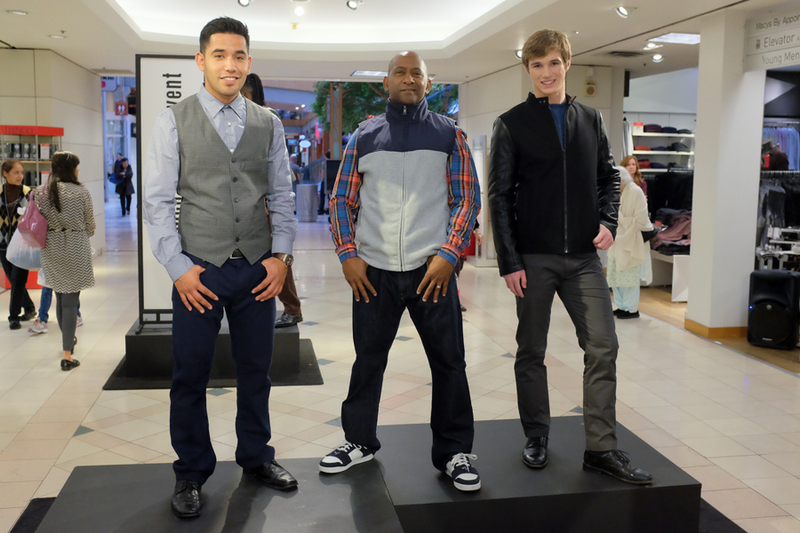 Macy’s Mens Night Out Live Updates – EVENT RECAP!! Tonight is the night! 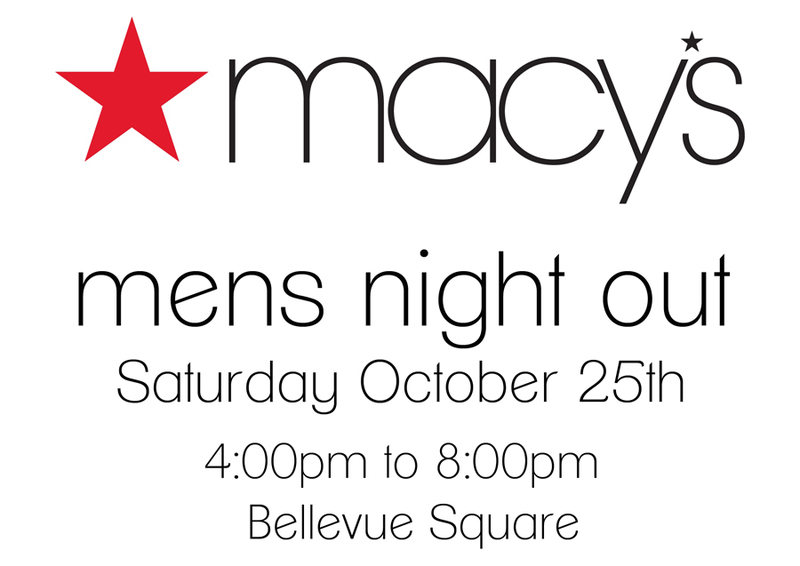 It’s the Macy’s Mens Night Out event at Macy’s Bellevue Square from 4:00 to 8:00. I’ll be live-blogging from the event and here’s how I ‘hope’ it works out; I’ll be posting updates and photos right here on this post, or on the 40 Over Fashion Facebook page. It all depends on the WiFi signal whether I’ll be posting here or to Facebook. Either way, I’ll be posting updates, so if you can’t be there in person (I hope you will be) you can still catch some of what’s going on. 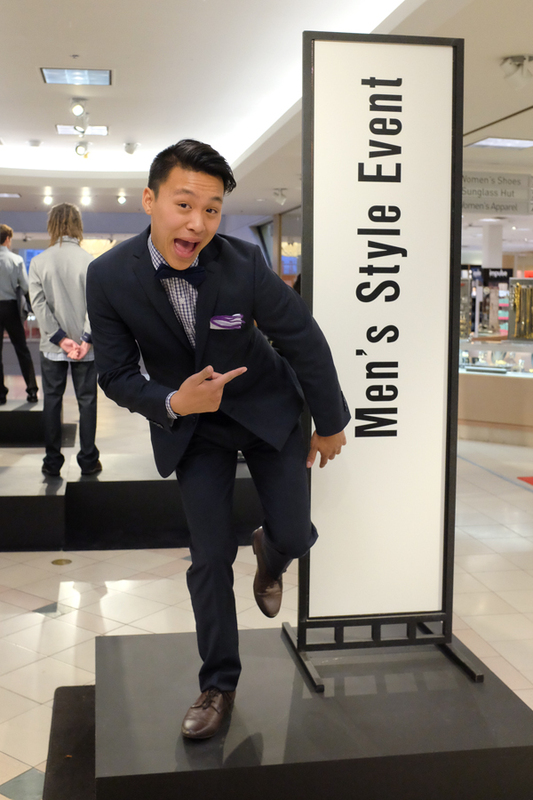 As you’ve probably been reading in my previous posts, I was invited to be part of the Macy’s Mens Night Out event at Bellevue Square. I helped with some styling and had a display of 5 complete looks that I put together as part of the 40 Over Fashion display. The event was amazing and I really have to thank Derieontay and Sarah from Macy’s for the opportunity. Sarah was great to work with and they both put on a fantastic event that was a lot of fun to be a part of. Here are the 5 looks I pulled. I went from suited & booted all the way to casual. The first look is all Calvin Klien. 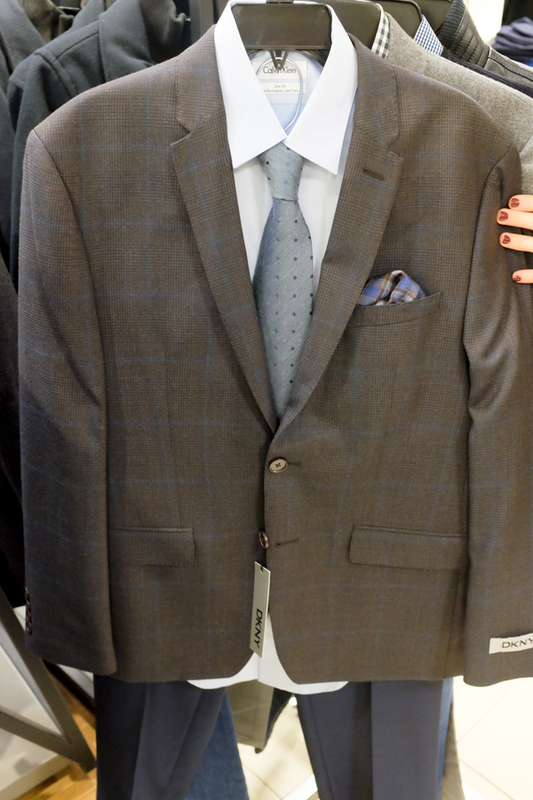 It’s a nice trim-fit charcoal gray suit, striped dress shirt with wide-spread collar and tie. The next outfit starts with a trim-fit DKNY sport jacket with a subtle blue windowpane pattern, dark blue Ryan Seacrest flat-front trousers, a solid light blue Calvin Klein dress shirt and a blue/green dotted tie. I went with dark blue trousers to show this look can easily go with dark wash jeans too. For the next look I went with a casual textured wool sport jacket from DKNY, a black & white check shirt from Bar III and medium wash jeans. The jacket is a great casual option because of the patch pockets. I want this jacket. The next outfit is all Calvin Klein again. 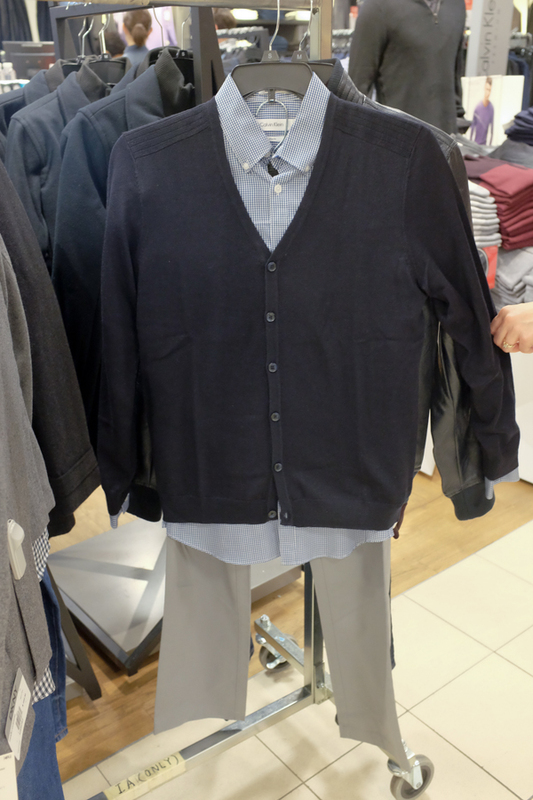 It’s a dark navy cardigan sweater over a small gingham blue pattern shirt with a button down collar and light grey chino’s. This is a great polished look for casual holiday parties. The final outfit is the bad-boy look. We have lightly distressed dark wash jeans with a thick plum mock-neck sweatshirt with heavy zipper details from Calvin Klein and a faux leather jacket from INC. Throw on some black boots and you’re ready to roll. I immensely enjoyed working with Sarah helping to style a few of the models’ outfits. A few in particular were the two looks on Andrew. 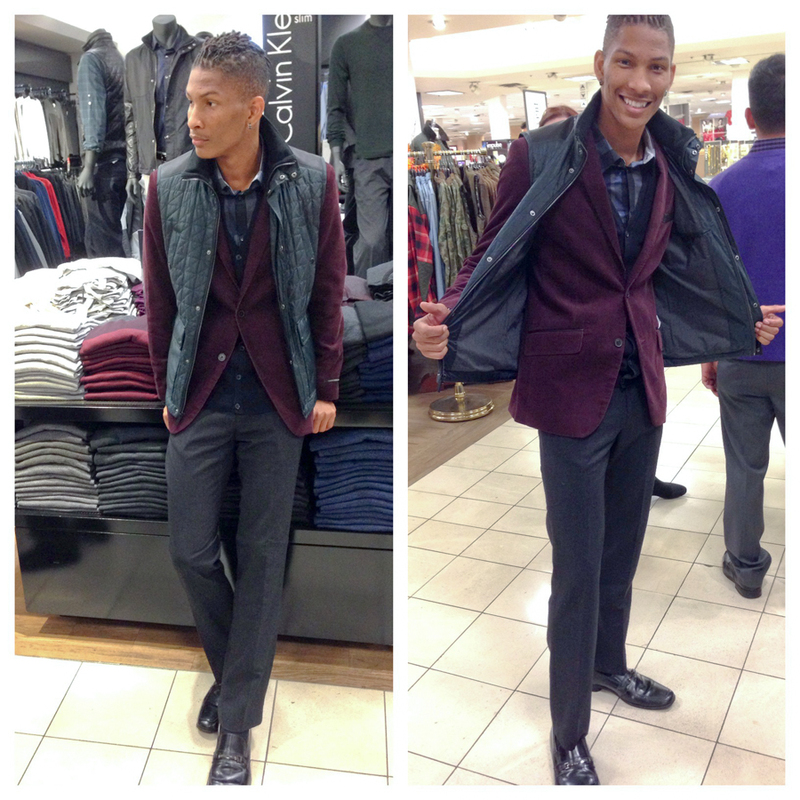 I really liked this plum blazer and I wanted to go with a puffer vest over it. I had originally pulled a grey vest, but Sarah found this fantastic quilted green vest and it was definitely the right call. We also pulled his great Polo outfit as well. Here’s a few more pictures of the event. It sounds like they’ll be holding another Mens Night Out in the spring, so if all goes well, I hope to see you there! Thanks, Sarah! You’re a rock star! 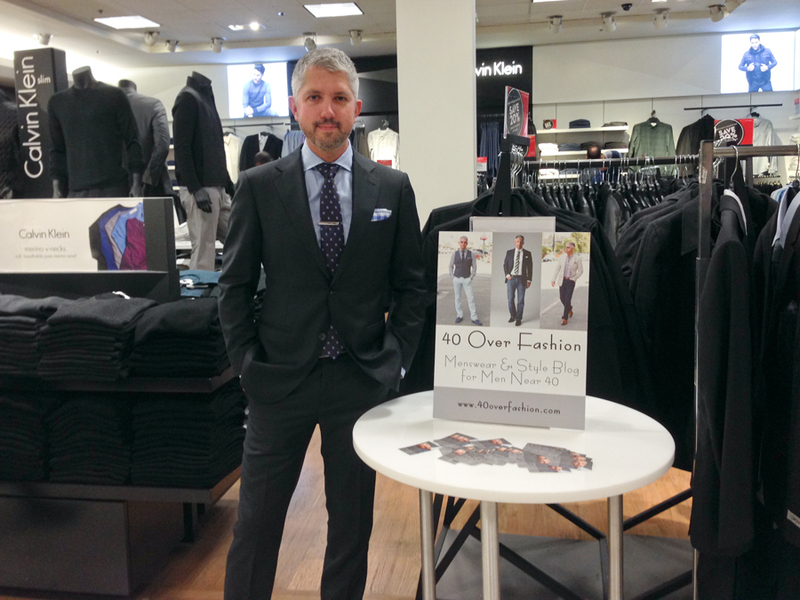 « 40 Over Fashion Has a Facebook Page!